Homebrewing is a great hobby. As a homebrewer and apartment brewer, nothing is more rewarding than brewing and fermenting your own creations and sharing them with friends and family. If you’ve found this blog post, you’re likely looking into starting the hobby and want to understand the equipment necessary to start brewing your first batch of beer. In this series of Apartment Brewing Tech posts, I’ll help take some of the confusion surrounding starter kits and homebrewing equipment, detailing the minimum and essential brewing equipment needed for homebrewing in an apartment or small-space based setting. Cheers, and happy brewing! In briefly surveying the web, there are loads of homebrewing starter kits, each with varying pieces of equipment and capacities, ranging from the very small, bare-minimum, one-gallon kits to the deluxe, five-gallon homebreweries. As a future/new brewer, deciding how many gallons of beer, often referred to as batch size, is an important first step in the path to homebrewing. For an apartment or small-space brewer, batch size consideration is especially key as larger batch sizes are generally more demanding on your living conditions, not only in storage but also in brewing and fermentation. Thus, before purchasing a particular kit, you may consider the following batch size factors listed below to aid in your final decision. Clean-ish stove top. Top: small burner. Bottom: big burner. This stove has seen over 50 brew days. Like a champ. Stove top size. Can it structurally support the desired batch size? 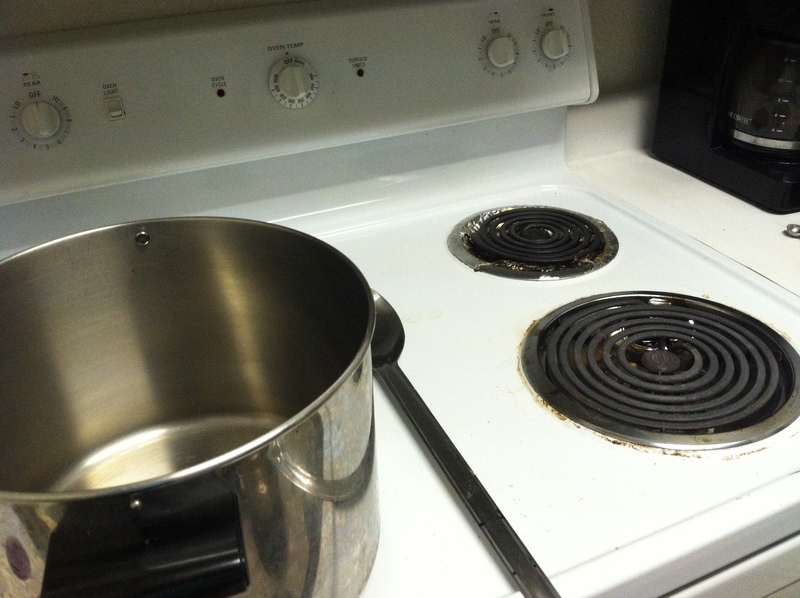 My stove top can hold up to 5.5 gallons of wort, perfect for 1- 5 gallon batches. Burner size. Along the same lines as stove top size, can it bring wort to a full boil? My big burner set near the highest setting (9 out of 10) can achieve a 5.5 gallon boil. Heat element type. Electric coils versus gas versus induction. I’ve always had electric coils in my apartment stove. It works well for my brewing process; however, it’s not ideal for precise temperature control, generally resulting in residual heating post turn off. I’ve never brewed with either gas nor induction so I’m not sure if this would impact wort heating and boil, but this may factor into batch size consideration. This is where storage and fermentation happens. Nice! Fermentation space. Do you have the extra space (at least temporarily) in a cool, low vibration, semi-dark place for fermentation? When I started brewing, my kitchen corner did well (cool, low vibes) and when covered with a black t-shirt, semi-dark. 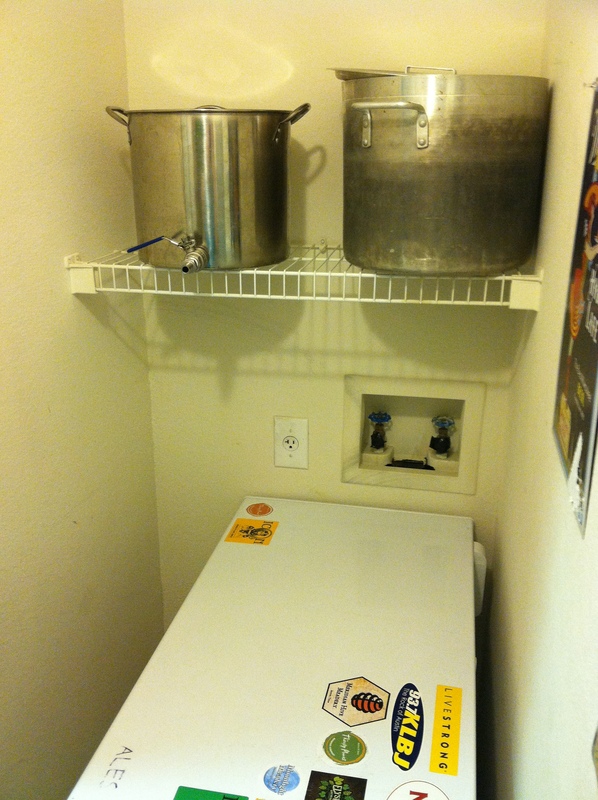 However, when I moved to Texas, the elevated apartment temperatures required use of temperature-controlled chest freezer technology for most ale and lagers as pictured. The latter was more space intensive; however, an underutilized laundry closet came in handy. Equipment storage. Do you have the space to store brewing equipment, for example kettle, buckets, racking canes, etc. This is particularly tricky in an apartment setting especially efficiencies. 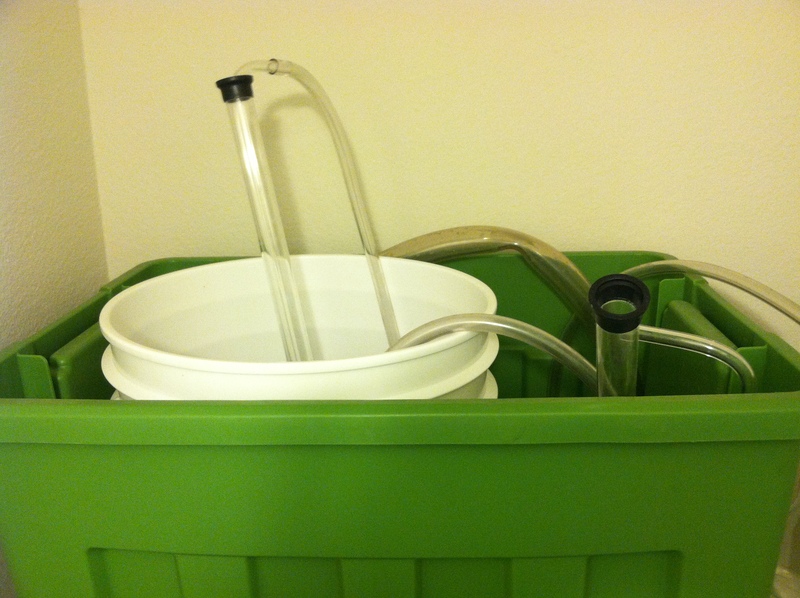 A typical five gallon starter kit can fit into 2 plastic totes, and stored in underutilized spaces. I fit mine in the same unused laundry closet. Other good storage spaces are under the bed, spare closets, unused kitchen cabinets, etc. In general, one-gallon brewing equipment takes up less space than a five-gallon all-grain system. Bottle/keg storage. You’ve made some fantastic beer, but now where to put it? A five-gallon kit makes roughly 48 bottles of beer, and if you plan to brew often, you can pile up the bottles pretty quickly, easily 100+. I store unused/clean bottles horizontal and interwoven in cardboard boxes. Before I started kegging, I stored my conditioning bottles in my bedroom, covered by an old, dark bed sheet for light protection. Many of the equipment storage tips can be used as bottle storage as well. However, when conditioning bottled beer, the bottle must remain upright. If you’re planning on kegging, an obvious investment in refrigeration is needed. Independent of refrigeration type, this will also take up space. However, unlike bottle storage, a kegerator/keezer can be a nice furniture piece in a living room. Storing brewing equipment in this nice green tote. All-grain. If you plan to jump straight into all-grain, this may come with additional equipment like a mash tun or hot liquor tank. Much of the mash tun/sparge systems available are designed for outdoor or large-space brewing operations, generally for batch sizes greater than five-gallons. If you plan to use a mash tun/sparge system, consider the additional storage factors and brewing area requirements necessary to make beer on the proposed system. In particular, your kitchen may not be well-suited for gravity-fed systems. Alternatively, if you plan to BIAB, it’s unlikely you’ll need more storage space or kitchen/stove area than a full-volume extract brewer. Money. Not my favorite subject (graduate student sadness) but if it’s a factor, consider starting small or at a level appropriate for your budget. Consider brewing equipment as an investment, not only into a great hobby, but also as a money saver in the long run, as you can produce commercial quality craft beer with some practice and experience for much less than market prices. In summary, the above listed are some of the key factors for batch size determination in your apartment or small-space living conditions. As for the equipment type choices, for example plastic versus glass, bare-minimum equipment list, my recommendations, etc, those are for future Apartment Brewing Tech posts. Look for links when posted in the future. Independent of whether you plan to maintain a normal apartment with some well-stored brewing equipment or turn your apartment into a small-scale brewery, remember to brew smart and safe. How do you homebrew in your apartment or small-space living conditions, and what other factors might determine an appropriate starter kit? Leave your thoughts, tips, and feedback in the comment section below. Cheers, and happy brewing! Great article. Our kitchen pantry has quickly become the “beer closet”. Thanks! Same here, speciality grains on the top shelf, base malts on the bottom shelf. Cheers! Hey, thanks for reading! Sounds like you are doing a thorough job for storing and maintaining for brewing equipment in your apartment. After bottling 40+ batches, I bit the bullet and invested into keg technology. Very happy I did. Best luck on the keezer build! Cheers! My apartment is only 780 square feet but came w/ a storage locker, so I store all my unused or extra equipment (carboys, hoses, racking canes, empty bottles, etc) in there. I got a chest freezer and temp controller off Craigslist and have is sitting just off the kitchen. It adds extra counter space for my wife who loves to cook and keeps my beer fermenting at appropriate temps (and bottle conditioning when in the upper 60s low 70s). Nice! Extra counter space via chest freezer technology, that’s a great idea. My current and previous apartments never had enough counter space. Thanks for sharing the tip! Cheers! Trying to get used to Kegging without a fridge at the moment. Having trouble getting the Co2 to remain in the beer.